Lock in a great price for Ilion Hotel – rated 8.4 by recent guests! Excellent in every aspect, we will be back again. Highly recommended ! Staff very friendly. Beautiful room and bathroom! Excellent breakfast in this beautiful original old hotel. Staff were great! Wonderful location. 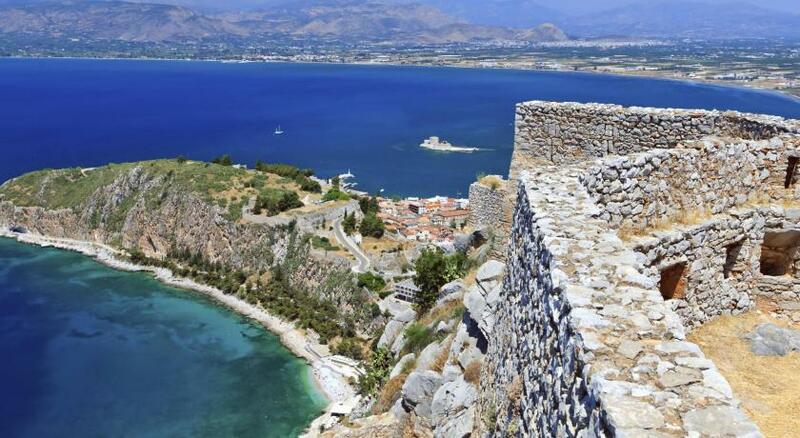 Nice location in the old town of Nafplio. Unusual architecture. Door to the hotel room opened to a semi-private courtyard; had to go through another door to exit the property. Quiet neighborhood compared to the other towns in greece I slept in. Old fashioned shutters block out almost 100% of the light from outside. Loved the vintage surroundings. Beautiful historical building. The staff were very friendly and professional, and they went out of their way to make our stay an enjoyable experience. Great breakfast; beautiful old house with interesting furniture and decorations; small terrace off our room; quiet and conveniently located. everything was so good. the staff very gentle . amazing breakfast. the food was delicious. Perfect location in the middle of old town. The hotel definitely has character and the location is great. Former residence of a 19th century mayor of Nafplion, Ilion is situated in the center of the historic quarter, overlooking Syntagma Square. It features classical furnishings and rooms with different themes. Ilion Hotel’s air-conditioned suites are equipped with satellite TVs, books for the guests and bathrobes. The rooms feature antiques from the owner’s personal collection.Wi-Fi is free in the public areas of the hotel. Ilion Hotel & Suites has a 9 a.m. - 11 p.m. room service. Guests can enjoy breakfast in bed, in the hotel’s bistro or on the grounds. Breakfast includes homemade pies and jams produced by the hotel staff. The hotel is just 800 feet from Old Town’s promenade where boats to the Bourtzi island fort depart from. When would you like to stay at Ilion Hotel? Luxuriously decorated suite featuring a seating area and a hot tub. Please note that this room type can accommodate up to 2 extra beds upon request. This suite has a window or balcony, spa bath and seating area. Please note that some rooms of this type can accommodate an extra bed. Please note that only one room of this type opens to a balcony. This triple room features a bathrobe, air conditioning and seating area. The bathroom comes with a shower cabin. This double room has a balcony or window, seating area and city views. The bathroom comes with a shower cabin. Located on the ground floor, this double room has a patio and air conditioning. The bathroom comes with a shower cabin. Please note that this room type has no view. This suite has a balcony with urban views, spa bath and hot tub. This single room has air conditioning and patio. House Rules Ilion Hotel takes special requests – add in the next step! Ilion Hotel accepts these cards and reserves the right to temporarily hold an amount prior to arrival. Please inform Ilion Hotel of your expected arrival time in advance. You can use the Special Requests box when booking, or contact the property directly using the contact details in your confirmation. We loved the interior, the location, breakfast, stuff and the city! Could not be better! And the view was wow! The room was quite small compared to the corridor and the size of the bathroom. There was no wardrobe, only a small hanger attached to the wall. The water in the bathroom was quite cold during the bath. During the breakfast there were no products and the guests had to ask for food. Quite a strange situation, and the lack of breakfast for all the guests who pay for it. Good location in the center, antique decor, friendly service, nice view from the balcony. Service helpful and nice to the customer. staff couldn't have been more friendly and helpful, good Greek breakfast, fresh squeezed orange juice, extraordinary decor -quirky! like all old houses in the upper old town, there are plenty of stairs! Even after contacting the hotel and letting them know they overcharged me 68euros, they refused it. Had to make a claim over my bank. Staff training should be improved on charging systems. The room is really run down - missing handles, massive marks and needs renovation desperately, pictures don’t fit reality , run down , stains and really poor looking so would not pay again. SEE PHOTOS ADDED. Still charged full price for Junior Sweet- not acceptable, as looks is main thing they sell. Lots and lots of dust, and which my companion was alergic to, hence if u got allergies don’t go. The lady who helped to organise my surprise. Location is great. The only problem was the low water pressure in the bathroom. Very nice place near old city center. Someone was having a great time during the night..and it was not me :(. Seriously..the hotel has no relevant flaws whatsoever. Breakfast (and portoKAlia juice) , bed, location, staff friendliness, value, old style, comfort, room size. The AC (for the cold winter months) is not enough. It was a bit chilly in the room. The room was a garden shed converted into a bedroom. It was cold and outside. Nobody stayed in the hotel at night, so I was alone in a converted garden shed in a patio. It was safe, but I didn’t enjoy my stay. If you don’t mind the outside and the coldness, then it’s kind of interesting to sleep in this room. The other rooms of the hotel weren’t like this one, btw. The person at reception did a good job and treated me very well when I said I was cancelling two nights booked. The room was clean. The locks on the room and courtyard were a bit challenging. The guests above us were up all night being very loud and the hotel staff only apologized. We felt a refund was in order.